Torx security srewdriver (T8), ideal for PS3 slim console repairs and many other uses. 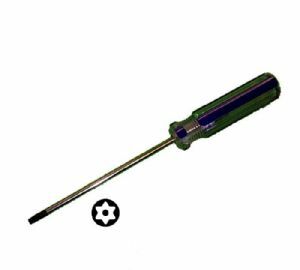 Torx security screwdriver (size T8), ideal for PS3 slim, PS4 and Xbox360 console repairs and many other uses. Makes life easier when opening your console to replace parts when you have the correct size of screwdriver. Fast Dispatch - On order payments received before 4.00pm on weekdays, item will be despatched the same working day. Nintendo console screwdriver required to remove the special 'Y' head console screws fitted into the base of these consoles.